Fast forward to being an adult- late 20's and hormone changes and thinking it was okay to pop a zit.. and a terrible mess ensued. Finally, I stopped using everything on my face for a few days. I had enough. 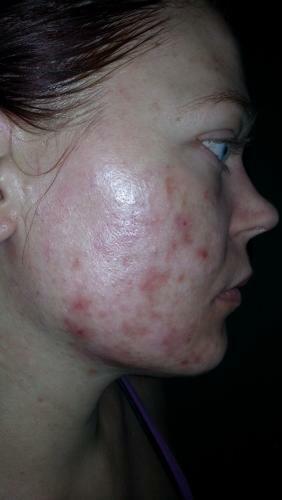 I got a handle on popping my zits, which I hated anyway, and I did some research and worked with a dermatologist who wasn't afraid to help me with alternative therapies. 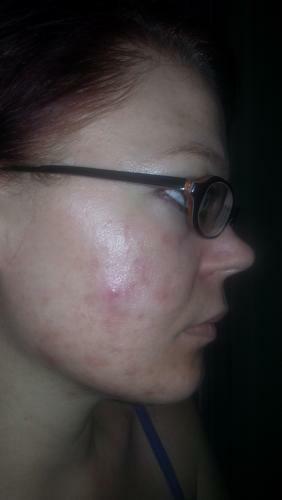 I found out that I had destroyed the acid mantle on my skin, which means the Ph balance was out of wack. There is GOOD and BAD bacteria on the face- using benzyl peroxide destroys both. Pores do NOT OPEN AND CLOSE- there are no muscles there. However, soft steam and warm water help loosen dirt in pores and pores can get larger the more dirt and oil it collects. So what's an adult to do? First I did research into alternatives to benzyl peroxide.. and researches found that a thyme tincture works twice as better and did not harm the helpful bacteria needed for the skin. Then I found out I have hard water, so adding a touch of baking soda to my water helps soften it. Then I did research into oils and honey. 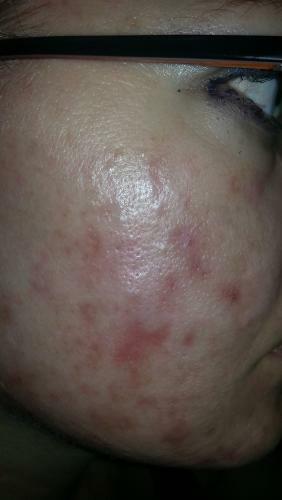 This is my oil cleansing method to clearing adult acne*. The oil cleansing method is simply- Like dissolves like, so therefore oil will dissolve oil. Remember that pores do NOT open and close- there are no muscles around them, HOWEVER, steam and hot water loosen dirt to make it easier to unplug your pores. After steaming your face (it will feel just a bit over warm but you dont need to sweat) apply a dollop of castor oil with a few drops of jojoba oil. Massage in circles over your face for 5 minutes. You will notice some bumps happen because the castor oil unplugs and pulls the sebum and dirt from your pores. Sometimes the plugs will actually come up and you'll feel a gritty piece as you smooth the oil over your face- wipe it off on your wrist and you can wash it away after. Once you've massaged your face well, take a washcloth and run it under hot water. Put the washcloth over your face for about five minutes- the heat will allow the castor oil to pull even more from your skin and then you can start to wipe off all the oil from your face. Keep rinsing and wiping until your face is dry on it's own. You will notice a couple drier areas on your face- like around your mouth or forehead. Any dry spots you have you can apply a drop of jojoba oil on for moisture. Next you can take a drop of tea tree oil with a couple drops of jojoba oil and spot treat anything you notice is forming. You MUST do this at least three days in a row, TWICE ADAY to get your face ph balanced. After the first few days, you can simply do it in the morning and at night just use water to rinse your face. * PLEASE PLEASE DO AN ALLERGY TEST BEFORE YOU USE THIS ON YOUR FACE. Mix a small bit of castor oil and jojoba oil on the inside of your elbow and let sit over night. The next morning use a small bit on the side of your neck where you can hide a rash if you think you might break out. * Castor oil actually pulls oil and dirt from your pores, but if there's ZERO change within three days you'll want to stop as this method is not for you. In order to purge the oil process from your skin you will want to soak your skin with a baking soda mask/peel (mix baking soda and water into a paste and let sit for 15 minutes) followed by fresh squeezed lemon juice on your face to restore the acid mantle. Scar removal - There's no way to really remove all scars, but you can lessen their impact on picture taking and such. Furthermore, I make sure to get 20 minutes of sun every day for maximum vitamin D absorption. If you live up north or in colder climates, please consider taking vitamin D3 supplements and still try to get some sun. The best time for UVB rays are between noon and one p.m.
You can determine yourself if you think this is worthy for your own regimen.